Timber Wolf Predator Moon Assisted Opening Pocket Knife - Silver | BUDK.com - Knives & Swords At The Lowest Prices! A beast in the moonlight, a beast in the field. A beast in the wild, a beast in the city. 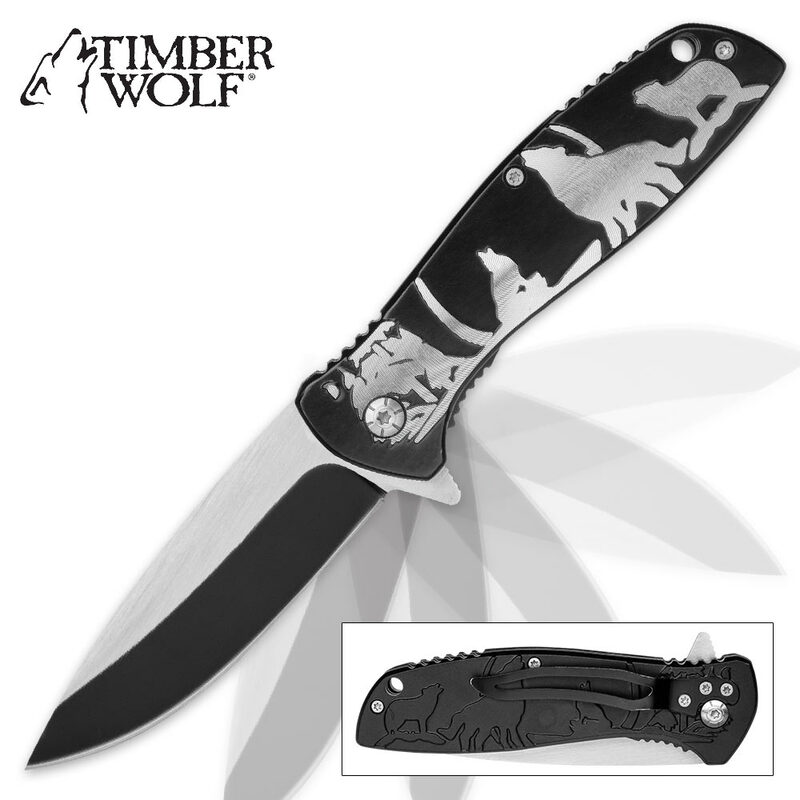 No matter where you live, how you use it or where you take it, Timber Wolf's "Predator Moon" Pocket Knife always rocks a set of jaws with the power to gnash apart any cutting task. 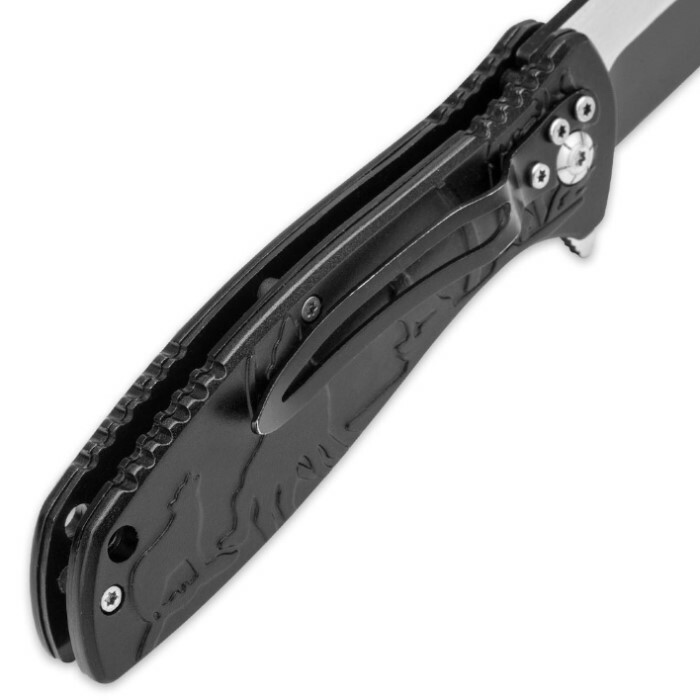 The proverbial "teeth" on this distinctive assisted opening folder comes in the form of a razor sharp 3 3/8" drop point blade, forged from rugged stainless steel with a striking two-tone black and silver finish. Like a wolf lunging toward prey, the blade deploys with awe inspiring speed, thanks to the Predator Moon's silky smooth assisted opening mechanism and handy flipper. The tough polymer handle features a breathtaking outdoor scene in striking raised relief - howling wolves against a colossal moon backdrop. Colored silver, the raised portions of this gorgeous 3-D scene offset the recessed black background beautifully, while perfectly complementing the gleaming blade. At 4 1/2" closed, the Predator Moon is easy to carry, especially secured with the built-in steel pocket clip or convenient lanyard hole. With its mesmerizing visual appeal, Timber Wolf's Predator Moon Assisted Opening Pocket Knife makes a smart display piece, especially alongside its iridescent rainbow-colored and gold-colored folder brethren (both sold separately). But that's not to say it doesn't bear the strength and potency to hack it in the real world, as well. On the contrary, the Predator Moon makes a terrific everyday carry sure to impress all who see you wield it.